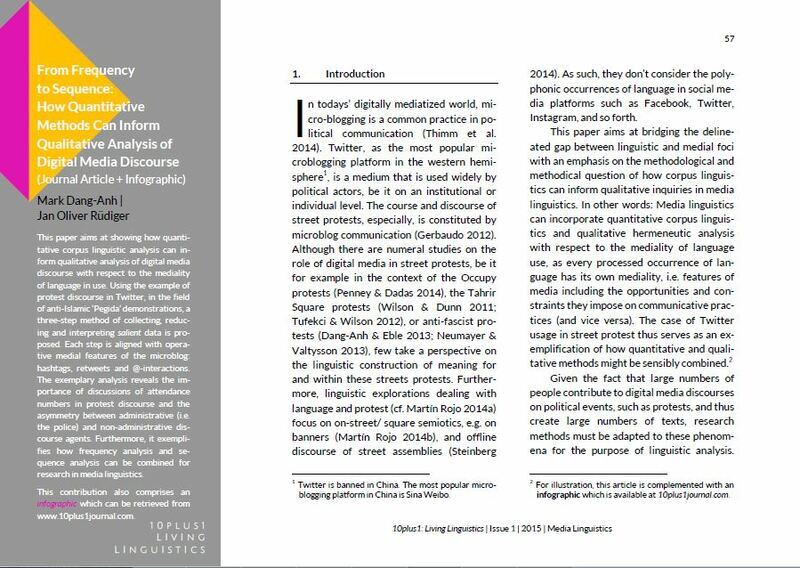 This paper aims at showing how quantitative corpus linguistic analysis can inform qualitative analysis of digital media discourse with respect to the mediality of language in use. 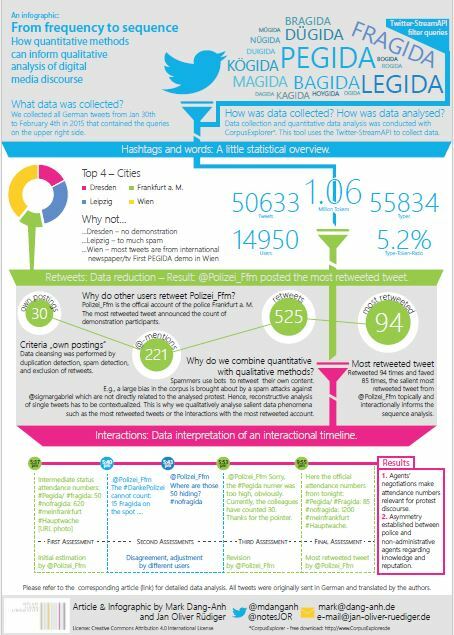 Using the example of protest discourse in Twitter, in the field of anti-Islamic ‘Pegida’ demonstrations, a three-step method of collecting, reducing and interpreting salient data is proposed. Each step is aligned with operative medial features of the microblog: hashtags, retweets and @-interactions. The exemplary analysis reveals the importance of discussions of attendance numbers in protest discourse and the asymmetry between administrative (i.e. the police) and non-administrative discourse agents. Furthermore, it exemplifies how frequency analysis and sequence analysis can be combined for research in media linguistics. Mark Dang-Anh, M.A., is a research assistant at the interdisciplinary Research Training Group (post-graduate program) “Locating Media” at the University of Siegen. His research focuses on Media Linguistics, Political Communication, protest communication, and cultural mediality studies. Jan Oliver Rüdiger, M.A., work as an IT-Freelancer and his PhD study is in the fields of corpus- and computer-linguistics. He is a member of GeKKo (graduated school) at the University of Kassel.